Indian Accent is a place I have been planning to go for sometime. And then I chanced upon tasting the food supervised by Chef Manish Mehrotra at the launch of the book First Food by CSE held at India Habitat Center. 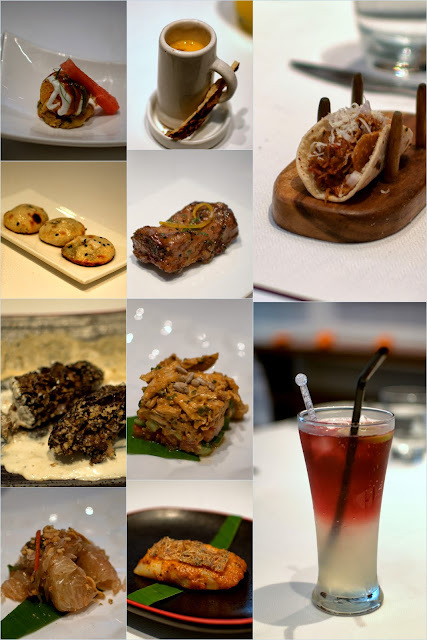 That was traditional Indian food from rural India served at the launch of First Food, all the recipes were from the book but the way the food was executed in it's absolute glory, left me spellbound. 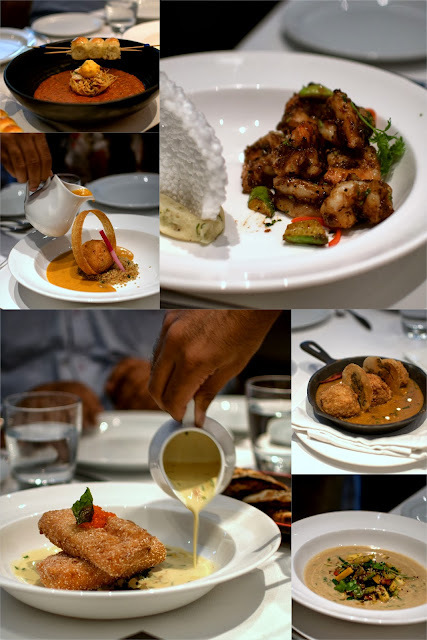 Indian food is versatile and a little bit of creativity in serving and combining flavors, adding a few garnishes and a bit of finesse in plating makes it a pleasure to experience. That pleasure awaits you at Indian Accent, located a bit in the maze of huge bungalows and clubs around Friends colony (west), look for number 77, The Manor. Very peaceful green surroundings, and a quite serene charm inside, you are enveloped with the magic of the gorgeous trees, bird chirping and the little knick knacks that are placed strategically. I loved the location being a nature lover, something like finding a treasure far from the urban jungle. A few journalists and bloggers were invited for a culinary demonstration by Chef Manish Mehrotra, which was preceded by an elaborate lunch planned by the Chef himself. We got to taste small servings of many of his creations that left us speechless. 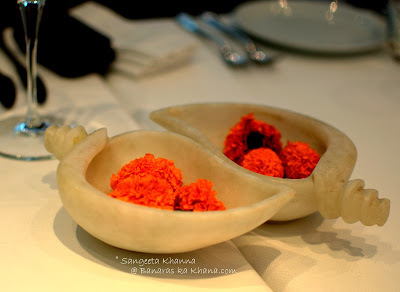 Interestingly, when I introduced Banaras ka Khana to Chef Manish Mehrotra, I was pleasantly surprised to know he had already read this blog while researching for Banaras food and wanted to recreate the Tamatar ki chaat. I promised him a good tamatar ki chaat some day. It's always nice to meet people with similar interests over good food, especially when an immensely talented chef has taken care of what all you eat. Manish Mehrotra told us about how the blue cheese naans are a hot favorite and how they make sure the boneless Basa fish fillet get a little fish flavor by added shrimp crackers on top. There were many innovative ideas to be witnessed that afternoon. I would recommend pepper prawns which came with lightly stir fried kundru with them. I am impressed with this inclusion of such a frugal vegetable. It tasted great and texture was just right. The pao bhaji with cute little paos, the rawa fry fish, the achari spare ribs, the desi tacos are all impressive flavors. Among starters you would see some chaat flavors to die for. The morel (guchhi, the Kashmir mushrooms) in a cheese sauce served with a parmesan cracker is a strong recommendation if you like mushrooms. The plumpest morels with superbly cheesy flavors. Loved it. The baked king scallops with moilee reduction is to die for. We learned this baked king scallops recipe from Chef along with a tofu kofta with gourd sauce and a dessert of jaggery and coconut creme brulee. What impressed me more that they had great vegetarian options as well, and they brought excellent options for gluten intolerant people too. Someone on our table was gluten intolerant and Chef Manish had enough options to serve her. Kudos for such versatility. The palate cleansers were served in innovative containers. Frozen sorbets were served in miniature ironing press and a miniature pressure cooker, a superb conversation piece. A frozen treat in a container that stands for heat. Lovely idea. It was a yummy pomegranate and kala namak sorbet, much loved flavors from our childhood chooran ki goli as Chef Manish says. 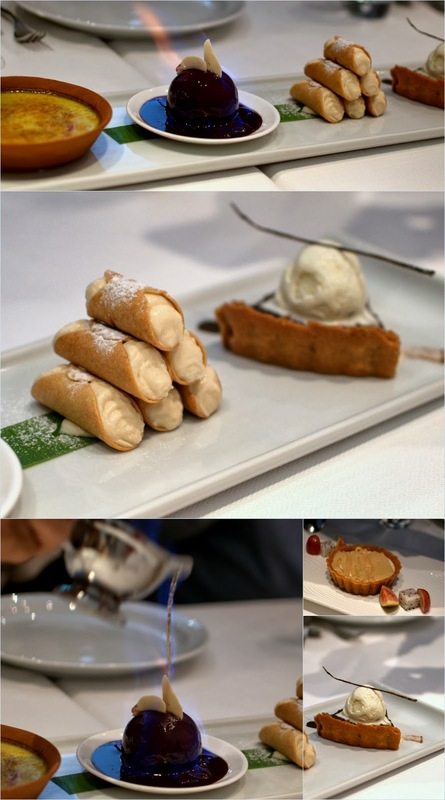 Desserts were even more fun but I can't have much sweet so a tsp each was good enough for me. A besan ka laddoo tart and coconut jaggery brulee was good. I loved the presentation but I am not the right person to judge a dessert as I am not much into sweets. Everyone else loved them all. The culinary demo was a complete hands down experience of watching a creative person playing with his instruments and ingredients. The kitchen and the classroom has been designed very nicely so one can see the Chef cooking even in a mirror placed strategically. He cooked silken tofu kofta, squash curry sauce served over wok tossed quinoa first. I like how Chef included lauki in this sauce. The next thing to be cooked was a beautiful baked king scallops, thalassery pepper butter with moilee reduction. The recipe is here. 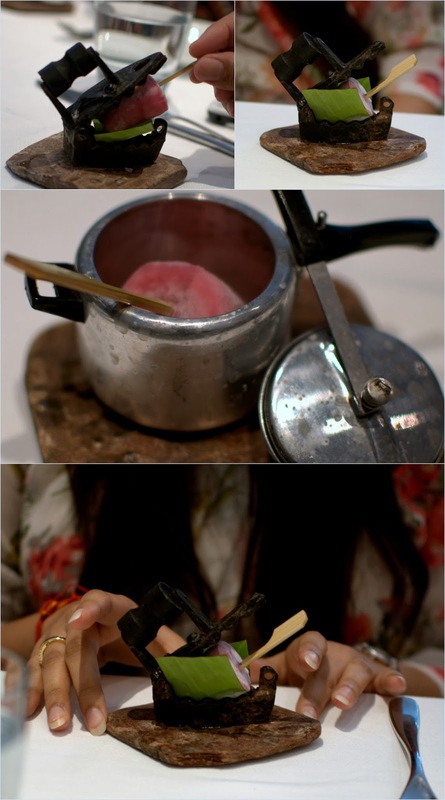 The dessert was flambeed with all the drama after making the custard and chilling it in an earthen bowl. It was a coconut and jaggery custard, bruleed to give it a hard caramelised crust. I love this kind of desserts, especially with coconut. Brulee or no brulee, coconut and jaggery make a dessert great for me. This culinary demo costs 2700 for a day, including a demonstration of 3 dishes, a 3 course meal and a recipe booklet. There is a 2 day culinary demo with 3 dishes each day and there is one more 3 day demonstration priced a bit higher but complete value for money. Try them if you want to learn nuances of making Indian food look great and taste like your grandmothers cooking. 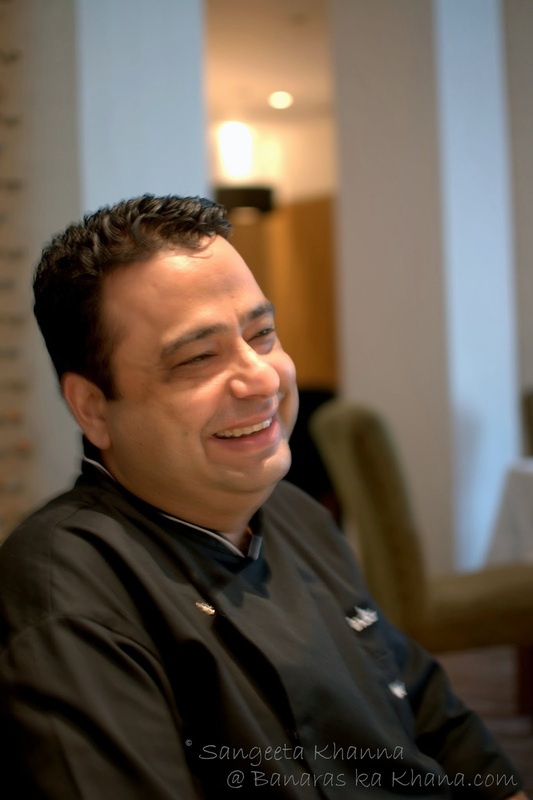 Talking to Chef Mehrotra leaves you touched with the magic, he is a passionate foodie who recalls forgotten flavors from his childhood and brings them to Indian Accent. His travels all across the world have enriched his repertoire. I would want to learn more and share more with the chef any day. Hi Sangeeta. Loved the read and I can completely understand your joy of meeting the chef. I've been his admirer through TV programs and loved watching his creativity and presentation. Obviously would love to meet him in person and learn too. Would check out the tamaatar ki chaat.